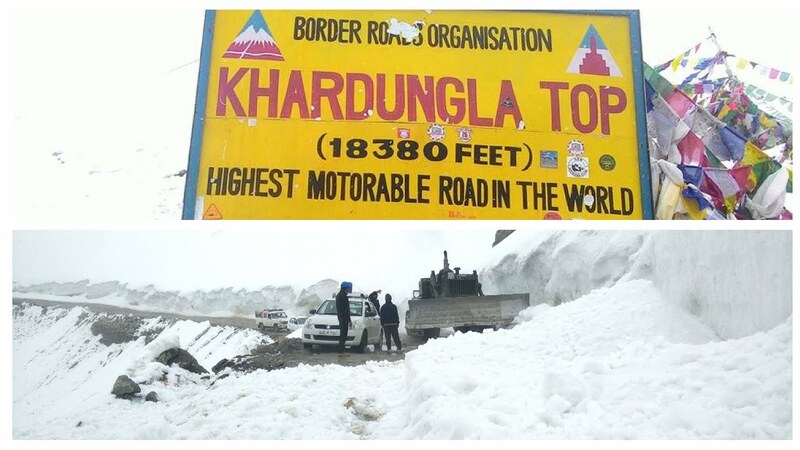 SRINAGAR: In a major feat, the Border Roads Organisation (BRO) has constructed the world's highest motorable road in Ladakh region of Jammu and Kashmir, passing through Umlingla Top at a height of over 19,300 feet. The feat was achieved under 'Project Himank' of the organisation. Being close to Hanle, the 86km long strategic road connects Chisumle and Demchok villages, located 230 km from Leh. These villages are stone's throw away from the India-China border in eastern sector, a spokesman of BRO said. Felicitating the BRO personnel for completing the herculean task, chief engineer, Project Himank, Brigadier DM Purvimath, said constructing the road at the altitude of over 19,300 feet was filled with life-threatening challenges. He said the climate at the location is always adverse for construction activities. "During peak summers, temperature hovers around minus 10-20 degrees Celsius, and in winters, it dips to minus 40 degrees. Oxygen level at the altitude is 50 per cent less than at normal places," Purvimath said. "Efficiency of machines and manpower declines by 50 per cent due to harsh climate and less oxygen level. Also, machine operators have to come down every 10 minutes for oxygen," he said. The brigadier said logistics was another major challenge at such an altitude. "Taking equipment at such a height, repairing and maintaining it is a major task since equipment face a lot of breakdowns," he said. Purvimath said because of this gradation, the personnel faced serious health problems like loss of memory, eyesight and high blood pressure. "Such a construction does not come without a cost, but given the national and strategic importance of the road, our men and machinery worked overnight to meet the targets set out by Director General, Border Roads," he said. "Acclimatisation of men is done at three stages — Leh, Shakti and Numa — before being inducted into the sector. Physical and mental fitness of men is emphasised upon for working in the area as the working season is limited in the region," he said. The Project Himank has already constructed roads like Khardangu La at an altitude of 17,900 ft and Changla Pass at 17,695 ft in Leh by connecting Nobra valley and Durbuk valley in the cold desert.